Softcover, 9 1/2 in. x 6 in. 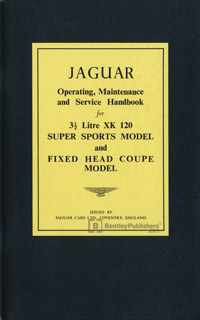 This Jaguar XK 120 Driver's Handbook contains technical data, maintenance procedures, service information and operating instructions. It details service procedures such as engine oil changing, carbureter tuning and cleaning, adjusting valves and bleeding brakes and clutch.